July 14 is known as Bastille Day in honor of the French Revolution-launching “storming” of Paris’ Bastille prison in 1789. On Saturday, July 16, 2011 I got to witness Philadelphia’s version of the holiday. It’s safe to say that it deviates just slightly from the original; ours has waterguns, Darth Vader, and TastyKake. 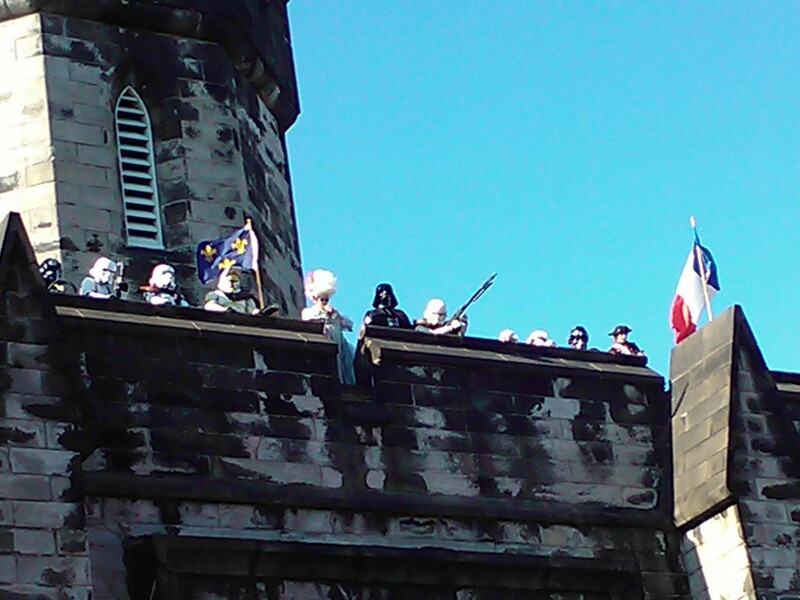 Marie Antoinette with her royal guard… and Darth Vader with his imperial stormtroopers. 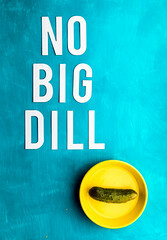 OK, sure, why not? Closer view. Marie Antoinette is the one who looks like a giant cotton swab. When I first moved to Philadelphia, I wondered why I couldn’t find any snacks by Hostess. Twinkies are surely not an essential part of any diet, but it was strange that, here, they didn’t even seem to exist. I asked someone about it and learned that Philly’s preferred blend of sugar and preservatives comes under the local TastyKake brand. 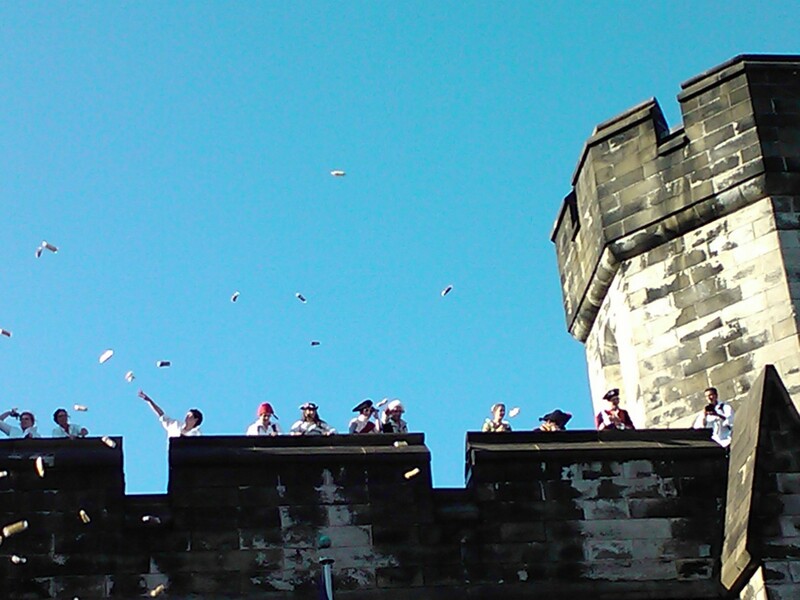 It is fitting, then, that Marie Antoinette would trade in her usual “Let them eat cake!” for “Let them eat TastyKake!” and have her royal guard hurl hundreds of (thankfully, wrapped) cupcakes downward at the turbulent crowd. “Let them eat TastyKake!” But first let them *catch* TastyKake. Whenever the announcer said “Reign of terror,” the revolutionaries onstage (portrayed by the Old Fort Mifflin Historical Society) aimed Super Soakers at the crowd and fired upon us. It was very Rocky Horror, especially considering the costumes. Attendees had been encouraged to dress either as angry revolutionaries or aristocracy, and a costume contest took place onstage for those daring souls who actually dressed up (I was not one of them, sorry). This was not long after a very lively can-can number had gotten the crowd clapping along to the familiar music. At tables throughout the street festival, children made crafts with Fairmount Art Center, DiBruno Brothers gave out samples of French cheese, Fare offered tips on French wine, and people of all ages got their faces painted and picked up little French flags to prepare for the revolt. 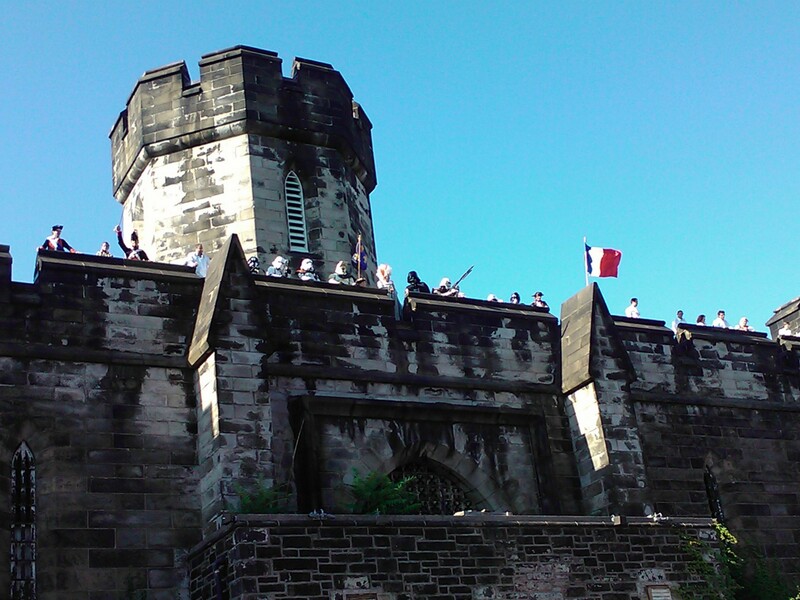 It is fitting that a local re-enactment of the storming of the Bastille would take place at Philadelphia’s own Eastern State Penitentiary, which is now a museum (that includes the former cell of Al “Scarface” Capone). It hosts an annual haunted house that is consistently ranked among the best in the nation so, if you’re into that sort of thing, it might be worth a visit this Halloween. 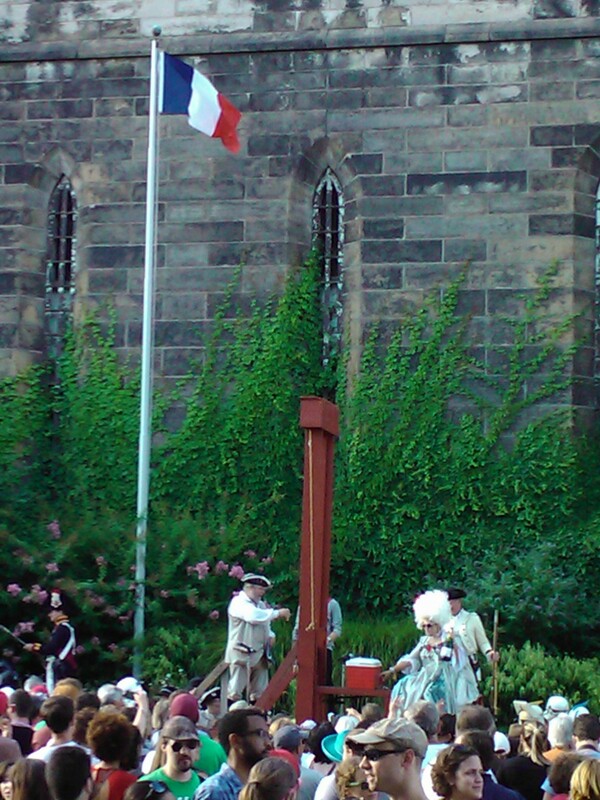 But, if you prefer your costumed craziness to take place outdoors, in July, during the light of day, then watch for next year’s Bastille Day Celebration in Philly. This unique, local spectacle is definitely worth seeing at least once. If you’re going to be guillotined, you might as well enjoy one last bottle of champagne. I have to say, I like her style. Cute post! I love a good champagne before being beheaded. Those first two shots are hilarious!